Astra 2F, which mainly provides direct-to-home (DTH) broadcast services for the Luxembourg-based operator SES, and the GSAT-10 communications satellite for the Indian Space Research Organization, ISRO. Today’s successful mission, the 51st in a row for the European launcher, once again proves the reliability and availability of the Ariane 5 launch system. It also confirms that Arianespace continues to set the global standard, guaranteeing independent access to space for all customers, including national and international space agencies, private operators and governments. 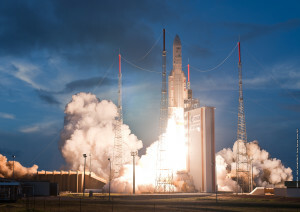 Arianespace’s latest successful mission, the fifth Ariane 5 launch in 2012, also further confirms the European launch system’s operational capabilities. Ariane 5 is the only commercial satellite launcher now on the market capable of simultaneously launching two payloads and handling a complete range of missions, from launches of commercial satellites into geostationary orbit, to dedicated launches into special orbits. 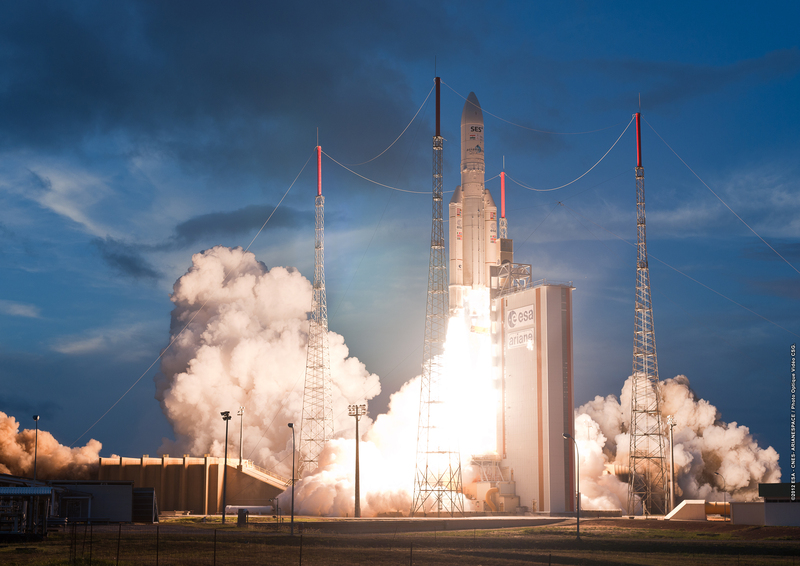 Arianespace offers the launch services that best match the demanding requirements of leading operators worldwide. Arianespace and SES have developed an exceptional relationship of mutual trust reaching back more than 20 years. Astra 2F is the 36th satellite from the SES group (Euronext Paris and Luxembourg Bourse: SESG) to use an Ariane launcher. SES operates the leading direct-to-home (DTH) TV broadcast system in Europe, based on its Astra satellites, serving more than 135 million households via DTH and cable networks. GSAT-10 is the 15th ISRO satellite to use the European launcher. Since the launch of the Apple experimental satellite on Flight L03 in 1981, Arianespace had already orbited 14 Indian satellites. The mission was carried out by an Ariane 5 ECA launcher from Europe’s Spaceport in Kourou, French Guiana. Liftoff was on Friday, September 28, 2012 at 6:18 pm local time in Kourou (5:18 pm in Washington, D.C., 21:18 UT, 11:18 pm in Paris, and on Saturday, September 29 at 2:48 am in Bangalore). ASTRA 2F. Built by Astrium using a Eurostar E3000 platform, ASTRA 2F weighed 6,000 kg at launch. Fitted with active Ku- and Ka-band transponders, ASTRA 2F will be positioned at 28.2 degrees East. It will deliver new-generation DTH TV broadcast services to Europe, the Middle East and Africa, and offers a design life of about 15 years. GSAT-10. Designed, assembled and integrated by the Indian Space Research Organization (ISRO) in Bangalore, southern India, GSAT-10 weighed about 3,400 kg at launch and offers a design life exceeding 15 years. The satellite is fitted with 18 C-band and 12 Ku-band transponders. Positioned at 83 degrees East, it will provide direct-to-home broadcasting, weather and radio-navigation services. Its coverage zone encompasses the entire Indian sub-continent.